Welcome to Legendary Adventures. This series is intended to be an accessible and versatile resource for gamemasters on a budget and with limited preparation time, or those simply looking for inspiration and new ideas. Available for less than a plain cheese pizza, each Legendary Adventure is compatible with the OGL 5e ruleset and offers gamemasters a captivating adventuring hub suitable for low-level parties, a collection of varied, original quests/adventuring materials which complement the setting perfectly, and appendices presenting new non-player characters, monsters, and rules options to further develop the unique theme of the locale. Legendary Adventures: Volume 1. This 300-page, full-colour hardback tome collects together the first 4 Legendary Adventures from DeepDark Designs, each of which can be purchased individually in digital formats. 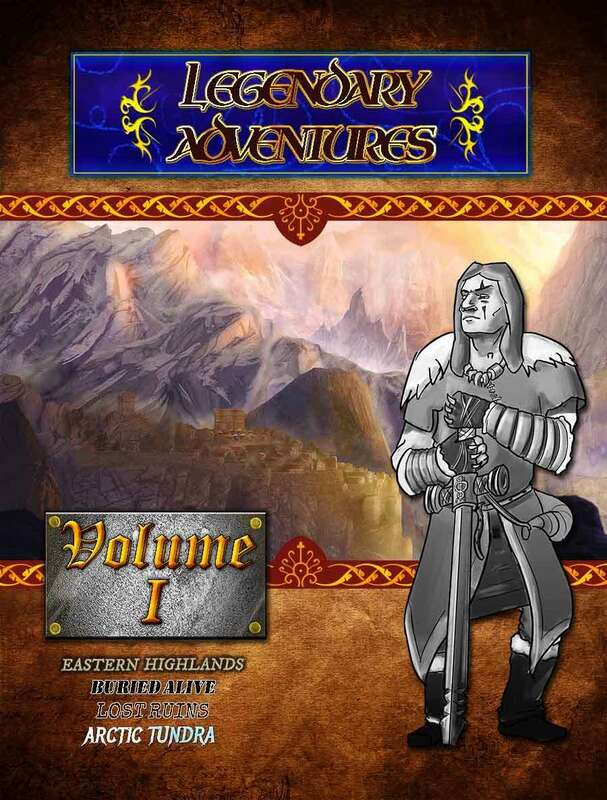 We have: Legendary Adventures: Eastern Highlands, Legendary Adventures: Buried Alive, Legendary Adventures: Lost Ruins, and Legendary Adventures: Arctic Tundra. More information about these products can be discovered on their respective product pages, sufficed to say that each offers a wealth of adventuring materials for low-level PCs; including quests, random encounter charts, new threats and adversaries, new player options, adventuring hubs, and more. For even more adventures from DeepDark Designs, look no further than Of Fey and Fear. A triumvirate of adventures to terrorise and traumatise any party.